A top SI editor goes along for the ride with the aerial athletes of Breitling Jet Team and manages to keep his wits and his lunch about him while going over 400 mph and in close quarters with other fighter planes. A version of this story appears in the July 6-13 issue of Sports Illustrated. Let’s get that settled right away, since it answers the first question asked by just about everyone who hears that I got to fly with the Breitling Jet Team. The BJT, sponsored by the eponymous, 131-year-old Swiss watch company, is the world’s largest professional civilian jet aerobatics team: a seven-man squad of high-speed, high-altitude athletes who flip and roll 7,500-pound fighter jets in formation and in unison, with wingtips usually less than 10 feet apart. This summer the team, a longtime favorite of airshow enthusiasts in Europe and Asia, is touring North America for the first time. Last month the Breitling Jet Team took a break from that tour and invited some aviation newbies to fly with them in New Haven, Conn., where we were each packed into a twin-seat L-39C Albatros military trainer jet and taken on a 25-minute ride of our lives. The group included a handful of media members like myself, Breitling clients and retailers, and friends of the brand such as third-year PGA Tour pro Morgan Hoffman and retired astronaut and former Navy fighter pilot Mark Kelly. Like the rest of us, Hoffman, a self-described adrenaline junkie and an amateur aviator who got his pilot’s license earlier this year, was jacked on the morning of the flight. My confidence skyrocketed the next morning when I walked into the hangar and saw a locker with my name emblazoned on front, a helmet sitting on top and a flightsuit hanging inside. A funny thing happens when a man who has no business wearing a flightsuit puts one on. You stand up a little straighter. You feel a pressing need to wear sunglasses, even inside the hangar. The pilot alphabet (Alpha, Bravo, Charlie…) starts to feel natural. You start contemplating Top Gun handles for yourself. (Wordsmith? Middleseat?) It’s like wearing Superman’s cape, only warmer. Here’s the thing about flying in a fighter jet at over 400 mph: it’s remarkably smooth and quiet. I was prepared for turbulence and deafening jet roar. But it was calm enough for Charbo and I to chat, and once you’re past the whiplash acceleration of takeoff it’s easy to forget how fast you’re going. And once we were in formation—a seven-plane triangle—it seemed perfectly natural to look to your left and right and see another jet less than 10 feet away. Morgan, my fellow adrenaline junkie over in jet No. 4, and I were close enough to wave to each other. Beneath us, Long Island Sound seemed to stretch forever. Things started to feel less natural when we moved past simple cruising. In perfect unison, the team weaved through a few barrel rolls and twisting wave-like maneuvers that Charbo called “lazy 8s.” “Are you OK, Steve?” Charbo asked. So far, so good. Stomach intact. 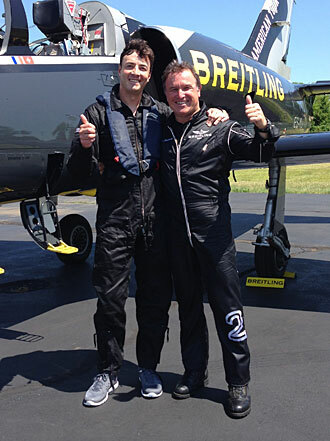 Stephen Cannella (left) and Bernard Charbonnel after soaring across the wild blue yonder. I was not singing: I was too busy dealing with the equilbrium-destroying sensation that comes when the sun passes over your feet and the blood that should be in your head pools in your toes. It’s hard to describe the feeling, which I felt again a few minutes later on our final break—a steep vertical climb out of formation into a reverse loop that put us in landing position. Despite the constant questions about nausea, you feel the G’s in your face more. You try smiling when the muscles around your mouth are being pushed back toward the nape of your neck. In the end, trust was the key to my experience too: When your life is in the hands of experts like this, there’s nothing for you to do but sit back and enjoy the ride. The only negative: regular flying has been ruined for me forever. Ask me about it if you see me hustling through a passenger terminal or stuffing myself into a middle seat. I’ll be the guy wearing a flightsuit.